Will Henry Thompson (March 10, 1848 – August 12, 1918) published his poem “The High Tide at Gettysburg” in 1888. But did he fight in the battle? I reprinted the poem because of Thompson’s reported service in the 4th Georgia Infantry. But I got it wrong. He and Crab and Judge never fought side by side. Here is what I pieced together about the author. A web post I relied on claimed Thompson had served in the 4th Georgia and taken part in Pickett’s charge (http://historyengine.richmond.edu/episodes/view/4405). But the 4th Georgia did not fight in Pickett’s charge. They watched from the town. And the regimental history, published in 1903, does not list any Thompsons in the companies of the regiment. It turns out Will’s father, Matthew Grigg Thompson, served in the 40th Georgia as a chaplain. The website Find a Grave lists his two sons as scouts (www.findagrave.com/cgi-bin/fg.cgi?page=pv&GRid=37616336). Did Will Thompson at least see the charge he wrote about? The history-engine website says he served “throughout the war.” But he was only 13 in 1861. And the 40th Georgia does not appear in the order of battle for Gettysburg (J. Busey and D. Martin, Regimental Strengths at Gettysburg (Baltimore 1982)). Both Will and his older brother did serve in the Army of Northern Virginia, but Will only mentions campaigns in 1864 and 1865. Neither man appears on the surrender rolls at Appomattox. According to the website Lawyers and Poetry, Thompson’s father preached as a Primitive Baptist in Indiana. There, in 1844, his wife, Diantha, bore their first son, Maurice (Myweb.wvnet.edu/~jelkins/lp-2001/thompson.html). In the middle 1840s, the father inherited a Georgia plantation and slaves. He moved the family to Georgia and the father gave up the ministry to become a planter. Most references place Will’s birth in Calhoun, Georgia. An online encyclopedia of the State of Washington reports that Will enlisted at 15. Both brothers fought in the battles of The Wilderness and Spotsylvania Court House (The Free Online Encyclopedia of Washington State History, http://www.historylink.org/). One of Will’s great orations (honoring Abraham Lincoln) states that brother Maurice received a bullet wound in the chest during the war. A comrade’s blood “splashed” Will at Spotsylvania Court House, he wrote. He also said he fought in the trenches around Richmond during the siege of Petersburg. After the war, both brothers moved to Indiana and practiced law together. Then Maurice began publishing fiction and poetry and left law for literature. He became a well-known novelist. Will Thompson also published poetry. He contributed a chapter to Maurice’s first book about the sport of archery (J. Maurice Thompson, The Witchery of Archery (Pinehurst, N. C. 1928)). Will published other books about archery and even won two bronze medals at the 1904 Summer Olympics at St. Louis. The Archery Hall of Fame contains photographs of him (with bow), but does not allow reproductions of them (http://www.archeryhalloffame.com/Thompson%20Will.html). (Memorial Address Delivered by Will H. Thompson Before a Joint Session of the Senate and House of Representatives of the Thirteenth Legislature of the State of Washington (Public printer 1913), pp. 21-22). Will had moved to Seattle In 1889. 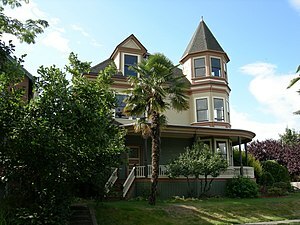 He served as general counsel for the Great Northern Railway and as a trial lawyer in Seattle (Seattle Landmarks: William H. Thompson House, in HistoryLink: The Free Online Encyclopedia of Washington State History, http://www.historylink.org). Thompson’s greatest acclaim followed his defense of his son Chester in a murder case. The trial began in December 1906 and lasted 59 days. Chester, at 21, had become “wildly infatuated” with the niece of Judge George Meade Emory of Seattle (1 H. Hunt & F. Kaylor, Washington West of the Cascades, Historical and Descriptive 379 (Washington: S. J. Clarke 1917)). When the judge refused to call the girl to the telephone one July day, Chester took a revolver to the judge’s home and killed him. The reporter wrote, “Jurors sat as men under a spell, with eyes riveted on the quivering old gladiator” (N. Y. Times, Feb. 1, 1907). Will Thompson was then 57 . Thompson refused to challenge one or two former Union soldiers for the jury. Thompson spent weeks proving the insanity of his son. He himself testified, leaving the witness stand to argue points with the prosecution. His final argument covered two days. (Washington, West of the Cascades 381). Poet’s Plea in Murder Case Brings a Verdict of Insanity. (N.Y. Times, Feb. 4, 1907). Will became known in Seattle as Colonel Thompson. He had purchased an 18-room mansion in 1897. He occupied the house with his family until his death in 1918. Seattle designated the house a landmark in the 1970s. Will Thompson did not watch or walk in Pickett’s charge. But he knew the battle of Gettysburg from his comrades in arms. 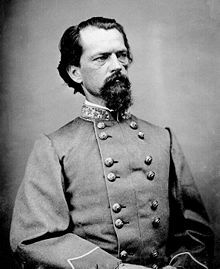 John Brown Gordon’s Brigade had, after all, joined with Doles’s Brigade on July 1 to smash the Union XI Corps and chase the Union army back through the town. At the end of the war, Gordon had risen to command the Second Corps of Lee’s army. And Gordon led the last charge of the Army of Northern Virginia at Appomattox. 2 Responses to Did Will Henry Thompson fight at Gettysburg? I’m not sure where to begin but this piece is shot full of inaccuracies and assumptions. Example: “He[Will H.] contributed a chapter to Maurice’s first book about the sport of archery (J. Maurice Thompson, The Witchery of Archery (Pinehurst, N. C. 1928)).” The Pinehurst Edition is an anthology published by Dr. Robert P. Elmer well after the deaths of Maurice and Will H. The chapters[articles] were picked by Dr. Elmer and Will’s article on the Okefinokee was added by Elmer, one Will published in 1915. The material in this edition is not a true reprint of Maurice’s 1878 or 1879 edition of “The Witchery of Archery” as only about half was taken from the 1878/9 editions. Poorly researched and one of the two “most inaccurate” pieces I’ve collected during the past 25 years or so of researching the Thompson brothers. I’d scrap it and do over. Will Thompson was born in 1846, not 1844 as I noted in my previous reply.